This project is something I did for JG Conversions. We needed a structured light scanner for doing larger objects and for portability. (I am afraid to take our main laser scanner -- with its thermal calibration, multiple lasers with lens and nested shipping boxes with foam between each layer -- out of the office...) It shows how a laser scan is part of a typical complete engineering project. The sensor, pictured above, for the camera is from a Logitech C9000 web cam. It has 1600x1200 resolution and the extra features like auto exposure control can be turned off. The lens that came with it works well for web cam use, but is too wide of an angle for our use. The UV, IR filter in the lens needs to be re-added in the new setup. The first thing I did is disassemble the camera and scan the circuit board that holds the sensor using our other laser line based 3-D scanner. I also needed to know the height of the actual image sensor under the clear sensor cover so I did another scan with no white powder spray since the lasers go thru transparent materials. The STL files from the scanner were imported into an intermediate CAD program and a 3-D model was made of the actual sensor board so I know where the mounting holes are with respect to the sensor and how much clearances are needed. The colored areas are the scan data. The gray is the 3D model. I measured the holes with calipers and pin gauges to get the hole positions more accurately. (JG Conversions does this for all scan + CAD modeling jobs with small holes.) The unused electrical connector for the original lens focus motor in the lower left of the picture was not modeled because I knew I was going to remove it from the sensor board to simplify the lens holder design. The CAD model of the sensor board was exported in to SolidWorks. This is the actual part after I machined it and attached it to the cover plate of a RadioShack case. I decided to use aluminum because I needed to cut the 1inch by-32TPI threads on a metal lathe and I did not want the part to distort as I cut it. ABS plastic maybe would work. Rapid prototyping/3-D printing is pretty good, but threads still need to be cut. Don’t look too closely, I can machine stuff, I am not a machinist! ;) Contact me if you want the stl file for 3-D printing. It has tons of tapped holes. I added a "few" changes ;). The second picture is after using it for a few months and with a higher-quality lens. My cut aluminum threads shave off pieces of the plastic lens threads which end up on the sensor, so put the sensor on after screwing on the lens and blowing everything out. More expensive lenses have metal bodies and threads. This is a steam powered air compressor from a model live steam train. The part was bent and twisted few degrees in the middle, which was noticed after we started modeling. (There is also some wide angle lens distortion in the pictures.) This was fixed in the resulting SolidWorks model. The original part is about 6 inches long and was at least at sometime working. Our same-scale copy of this part is for show only. Real 1/8 inch head bolts, nuts, and pipe fittings are added by the client later. This part was quoted at $500 for an STL mesh of the part which exactly matches the scan or $875 for development of a much cleaner looking SolidWorks model. It costs an additional $1200 to rapid prototype fabricate in stainless steel. It is possible to get working examples of this compressor based on conventionally produced (6 pieces of cored die-cast in brass) castings sets for cheaper than this so the project was partially completed as an engineering study. 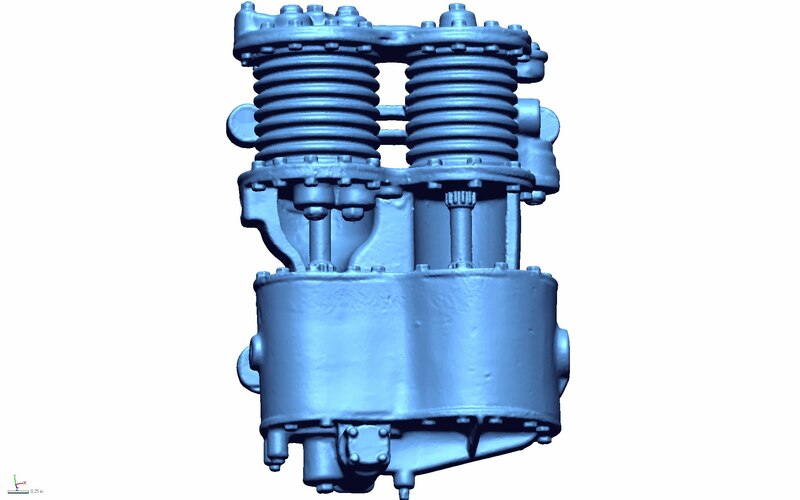 For more details on this project, see the Project Log here: 2 Cylinder Steam Powered Compressor. This is the original part from the customer. Here is the data from the scanner. It looks solid because the sample points are so close together. Here is the CAD Model almost completed, just after transferring to SolidWorks. Here is the next interesting project. As our information source we went to the actual train to take pictures since we could not remove and 3-D scan the actual train part. We also had the railroad part placement drawing from 1944. The full sized Exhaust Steam Injector is mounted on a Bigboy steam engine(Union Pacific 4012, pictured) as well as the Challenger Engine which the client was building. The original is around 5 feet long and mounted on the left front of the engine. Project should be quoted at $400 for a complete CAD model, not including taking detailed pictures at the train site. The projects costs $839 to fabricate directly into stainless steel. For more details on this project, see the Project Log entry Exhaust Steam Injector for Steam Engine. You can see just how big this engine is in real life! The picture on the right is of the back side. We did this project in 7 parts so the client can drill, tap and bolt the parts together just like the original to get maximum detail. The part is hollowed out to save rapid prototyping material costs. The extra 4 inch long rectangular block is so client can quickly verify scaling. Here are the pieces when rapid prototype fabricated in stainless steel. The 1/16 inch thick webbing in the bottom of second picture is the smallest feature obtainable by this fabrication process in stainless steel. The client will add the smaller features by hand. Plastic parts can be fabricated with smaller details for less than 1/4 the cost, but will melt when the engine is fired!